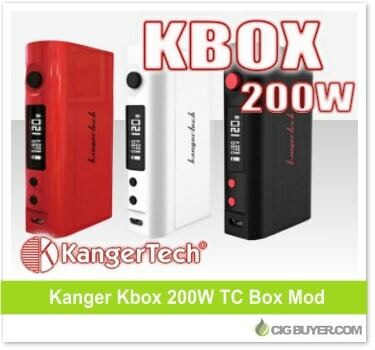 Kanger’s new lineup includes the Kbox 70W, the Kbox 120W and the most powerful of the bunch – the Kanger Kbox 200W Mod. From what we understand the 200W is exactly the same as the 120W, but obviously it has more power and a slightly higher price tag. If you can actually use 200W of power, the PCB supports Ni200, Titanium, SS and Nichrome coils and fires down to 0.05 ohms; with a peak efficiency of 97%+. Powered by two 18650 batteries, it’s compact, precise and includes magnetic battery door, large LCD screen and spring-loaded 510.